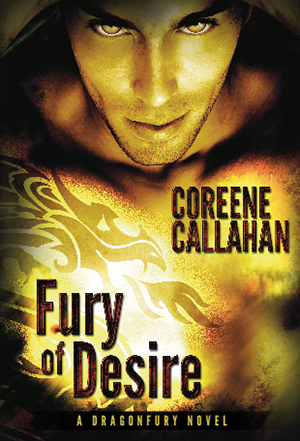 Giggle PODCAST with author Coreene Callahan + Spotlight on Fury of Desire + Contest! Giggle PODCAST with Coreene Callahan! PS. Come back Saturday for my vlog review of Fury of Desire! No warrior of the Nightfury pack is more complicated or damaged than Wick. Scarred from a childhood of slavery and torture, Wick cannot bear the touch of another person. But all bets are off when he meets J.J. Solares. When she is unjustly imprisoned, Wick agrees to help rescue and keep her from harm. But Wick lives a life of self-imposed isolation and venturing into the world to seek justice for J.J. may be more than he can bear. Brutalized by the harsh reality of prison, J.J thinks she is hallucinating when a majestic dark-haired god sweeps in to save her—and Wick is shaken to his core by the attraction he feels for J.J. But neither is out of harm’s way yet. When they find themselves at the center of a Dragonkind war, they are forced to make the ultimate choice—surrender to their fears or accept each other’s love. your choice of book 1,2,3 or the newest Fury of Desire! Loved the podcast! I just finished reading Possession by J.R. Ward and now I’m reading Fury of Desire! Reading Relentless by Cassia Leo, going to read the series in the next few days. Right now I am reading Vampire Games by Tiffany Allee. So far, so good and I love the heroine. I am currently reading Styxx by Sherrilyn Kenyon. I love her Dark Hunter series. I’m reading ‘The Wallbanger’ by Alice Clayton. It’s so GREAT and HIL-AR-IOUS! Previous PostPrevious Release Day Spotlight on First Bite by Dani Harper + Contest! Next PostNext Spotlight on J.A. Huss’ Panic + Excerpt + Contest!